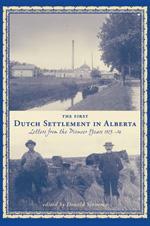 Translated from Dutch to English, this collection of letters offers a unique perspective on the early pioneer years of the Dutch community in southeastern Alberta. The letters provide first-hand accounts of the preparations to immigrate, the hardships of the pioneer years, and the transformation from the most basic homesteading conditions to progressive rural communities, including the towns of Granum, Monarch, and Nobleford. In fact, within just a decade, new railroads, towns, churches, schools, and even telephone service had been established. Based on extensive research, the book also includes maps, archival photographs, and an appendix listing all the Dutch settlers in the region between the years of 1903 and 1914. The First Dutch Settlement in Alberta is an invaluable and fascinating collection of primary source material that offers a wealth of information for genealogists and historians, and celebrates the pioneering spirit of Alberta’s early Dutch community . Donald Sinnema earned his PhD in historical theology from St. Michael’s College at the University of Toronto and is currently a professor of theology at Trinity Christian College in Illinois.